SW Piano Movers moving a baby grand piano. 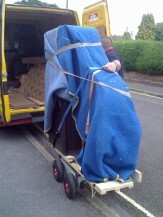 SW Piano Movers based in Upper Norwood, South London, and move upright and baby or boudoir grand pianos both locally and across the UK. We have been moving pianos for over 14 years. We can also dispose of unwanted old pianos. If we have done a good job for you, please let us have your comments about our Service. You can leave a review by clicking the box below. You can use the form below to publish a comment on my website. You can also scroll down below the box to read what previous clients have written on this site, or even further down for supervised reviews of our service by FreeIndex. Please let us have your comments about our Service. What other clients have said. Please scroll up the page to leave a comment. Click here to offer your own piano.